H. Rick Bamman - hbamman@shawmedia.com Mathnasium franchisee Mike Ammer of Huntley, works with a student in the South Elgin location. In November 2013, 51-year-old Ammer, of Huntley, found himself feeling burned out in an industry he'd been part of for 32 years. Baby boomers, generally people born between 1946 and 1964, are twice as likely than millennials to plan their own businesses, according to January Gallup Poll findings. The poll, from a study of nearly 2,000 American baby boomers, observed the reasons why they tended to set out on these business endeavors at the time they did. H. Rick Bamman - hbamman@shawmedia.com Former car dealership manager Mike Ammer, a Mathnasium franchisee, works with a student in the South Elgin location. "I was gone from the house 14 hours a day," Ammer said. "I was good at what I did, and I did have a passion for it, but I felt myself losing that passion, and when that happened, I knew it was time for me to move on." 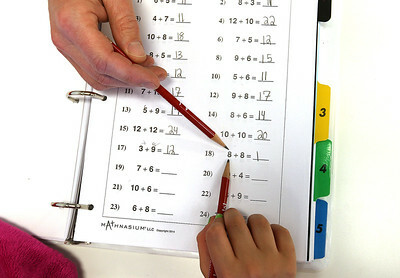 H. Rick Bamman - hbamman@shawmedia.com Mathnasium franchisee Mike Ammer of Huntley, congratulates a student for her answers during a tutoring session at his South Elgin location. In the automotive industry, for 32 years, Ammer had been managing two different car dealerships, one in Chicago and one in Merrillville, Indiana. "I was gone from the house 14 hours a day," he said. "I was good at what I did, and I did have a passion for it, but I felt myself losing that passion, and when that happened, I knew it was time for me to move on." 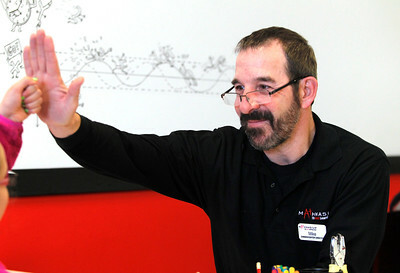 Mathnasium franchisee Mike Ammer of Huntley, works with a student in the South Elgin location. In November 2013, 51-year-old Ammer, of Huntley, found himself feeling burned out in an industry he'd been part of for 32 years. Baby boomers, generally people born between 1946 and 1964, are twice as likely than millennials to plan their own businesses, according to January Gallup Poll findings. The poll, from a study of nearly 2,000 American baby boomers, observed the reasons why they tended to set out on these business endeavors at the time they did.